SAINT JOHN, N.B. -- A New Brunswick jury has found Dennis Oland guilty of second-degree murder in the death of his father, prominent businessman Richard Oland. Oland began crying uncontrollably and said, "Oh my God," after the verdict was read Saturday at the court in Saint John, N.B. Justice John Walsh thanked the jury for its work. A statement from Oland's mother Connie released shortly after the verdict said the family was shocked and saddened by the outcome of the trial. "Our faith in Dennis' innocence has never wavered and the jury's decision has not changed that belief," the statement said. "We will now discuss our options with the legal team. We sincerely believe justice will eventually be served." A statement from Oland's uncle Derek also maintained his innocence. "We continue to believe our nephew and cousin Dennis is innocent and we will support him and his family members through the course of whatever legal actions will unfold," it said. The lengthy trial, which began in September, heard from nearly 50 witnesses and revealed a case built on what Walsh called largely circumstantial evidence. During his lengthy instructions to the jury this week, Walsh repeatedly cautioned jurors that they must be convinced of guilt beyond a reasonable doubt in order to convict. "If you believe Dennis Oland's statement and testimony that he did not commit this offence, you must find him not guilty," said Walsh. He said they could only convict if the rest of the evidence as a whole proves Dennis Oland's guilt beyond a reasonable doubt. The body of Richard Oland was found face down in a pool of blood in his Saint John office on July 7, 2011. He had suffered 45 blunt and sharp force blows to his head, neck and hands, although no weapon was ever found. The Olands are an establishment family in the business history of the Maritimes, having founded Moosehead Breweries. Richard Oland left the family business in 1981. 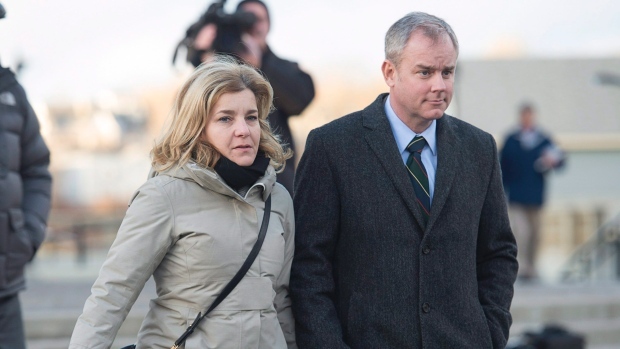 During the trial, the Crown focused on possible issues of motive including Dennis Oland's financial difficulties and the knowledge that his father was having an affair. But in his own testimony, Oland downplayed his finances as a recurring issue in the life of a financial adviser, and said he had not discussed his finances or the affair with this father. The defence called just three witnesses: blood spatter expert Patrick Laturnus, forensic computer analyst Geoffrey Fellows, and Oland himself. The Crown called more than 40 witnesses. Pathologist Dr. Ather Naseemuddin, who performed the autopsy on Richard Oland, described the injuries to his body in detail, including 14 skull fractures. The jury also heard a detailed description of the hundreds of blood spatter stains at the crime scene and were told the killer or killers would likely have gotten blood on them. During an interview with police on July 7, 2011, Oland told Const. Stephen Davidson that his father was a difficult person at times but rose to the occasion and funded his divorce. Oland said he didn't have any involvement in his father's death. "I had no reason to kill him," he said. Oland also told police that he visited his father's office twice on July 6, 2011, and that he had been wearing a navy blazer. Testimony from witnesses and surveillance camera video showed Oland wearing a brown jacket, and it was eventually learned from Oland himself that he went back to the office a third time to retrieve a logbook for his uncle. The Crown pointed to those inconsistencies when cross-examining Oland, who said at the time of his statement to police he was nervous and in shock. The work of the Saint John Police Department was also under scrutiny, particularly at the crime scene. The jury was told officers used the back door of the building before it could be fingerprinted. They used a washroom for two days before it could be examined, and they did not ask a pathologist to determine if a drywall hammer was the probable murder weapon. The key piece of evidence for the Crown was a brown jacket worn by Dennis Oland that had a number of small blood stains and also DNA that matched the profile of Richard Oland. However, none of the expert witnesses could say how long the blood had been on the jacket or how it got there. The defence pointed to video that showed Dennis Oland and his wife shopping later on the evening of July 6, 2011 when people working below Richard Oland's office say they believe they heard the sounds of the murder.